As of December 31, 2014, I retired from full-time teaching in Humboldt State University's Department of History. While this website will remain online, it is no longer maintained. PLEASE NOTE: Next class meeting, Thursday, September 10, you will work in groups to create possible questions for the upcoming exam. Please bring your lap top, notes, and/or anything that you will need to help you develop some thoughtful essay questions about what we have learned in Unit I.
that the California Indians suffered greatly during the era of Spanish rule. Today, we are going to learn some further details about California at the end of Spanish rule and then continue our story by learning how California fared under Mexican rule. But first, let's take a look at the map of Mexico as it appeared in 1821. What do you notice? Mexico was a HUGE country in 1821. But in just 25 years, the Mexican government would lose almost half of all its territory - the territories of Alta California and Neuvo Mexico, as well as the Mexican states of Sonora, Chihuahua, and Texas. Further, the the majority of the Mexicans living in these former Mexican territories and states will gradually lose possessions of most of their lands under the governance of the newly created American states of California and Texas. Imperialism was again the culprit. But this time the imperialists were not the Spanish. They were the Americans. To understand the political evolution of life in California under Mexican political control. To trace the various movements of foreigners into Mexican California - especially those of the Americans. To learn about the origins of the Bear Flag Republic. To examine a chronology of how the Mexican-American War and the Treaty of Guadalupe Hidalgo culminated in the American conquest of California. To understand the consequences of the Mexican-American War. To brainstorm some possible approaches to addressing the questions on the upcoming Unit Exam. When Mexico gained its independence in 1821 and finally had the time to look at their northern territory in Alta California, it found a land that had been badly governed by the Spanish in which two groups controlled all the power - wealthy Spanish ranchers, the Californios - and the mission padres. Thus, the political question for new the Mexican government became - how could they change this power structure? The first attempt came in 1824 with a new constitution that established the Federal Republic of Mexico which was a dramatic change from autocratic rule under the Spanish. Under the new government, California became a territory - not a state - and territorial governors were appointed by Mexican authorities. California leadership under Mexican rule was similar to what it had been under Spanish rule - military despotism. A provincial legislative branch was created, but it only met when the governor convened it and then, only served as an advisory rather than a legislative body. In effect, the governor of California acted as both civil and military executive, controlled the lawmaking process, and exercised judicial authority in the most important territorial matters. Control from Mexico City was sporadic a best, largely because the government did not have the money to pay soldiers. Because few Mexicans had experience with representative government, the Mexican Congress failed to set any clear policies for administering and financing its territories, ensuring that they remained destitute and poorly organized. From the beginning of Mexican rule, governors were appointed who were either unqualified or who had their own special interests in regard to California. From 1831-1836, 11 different Mexican governors came to California, as well as three other men who were appointed but whom the Californians would not permit to take office. Thus, within a short period of time, real power in California belonged to the wealthy Californios. Increasing the Mexican population. The Mexican government needed a substantial Mexican population to maintain control over California and thus, it offered many incentives for Mexicans to immigrate, but few people took the chance. California was an impoverished backwater in the minds of most Mexicans and the new government made matters worse by enacting a policy of sentencing convicts to life in California as punishment for their crimes. However, by 1846, the Mexican population had almost doubled, not because of immigration, but largely due to natural birth-related increases. Alta California had a Spanish-speaking population of almost 10,000 - making it the least populated of all the Mexican states and territories.. There were about 800 Californio families who primarily lived on large ranchos located in Southern California. At the same time, other immigrants were showing some interest in California, spurred in part by the new Mexican law allowing foreigners to own land in California once they had become naturalized Mexican citizens and converted to Catholicism. By 1830, 130 Americans had settled in California. By 1846, about 1,300 Anglo-Americans and mixed group of about 500 Europeans had settled in the area between Monterey and Sacramento. These immigrant men largely dominated a struggling trading industry while the Californios dominated ranching. The Californians themselves had little problem with the American newcomers, largely because they settled, became an integral part of society, and often intermarried with the Spanish gente de razon. 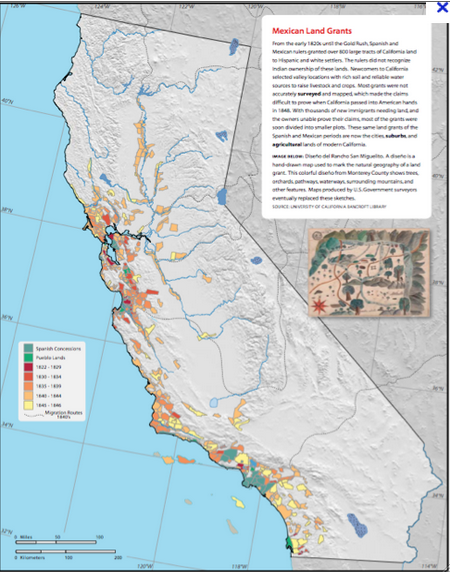 So, while the numbers of immigrants to Alta California increased somewhat during this period, its increase was due to twol factors: nominal political changes from the Mexican government as well as increased Americas and Europeans interest in the new Mexican frontier. And it will be the immigration of these foreigners that eventually will bring about the Mexican loss of California. Secularizing the Missions. Efforts to secularize the missions - or pass the missions from control of the church to control of the converts - began under the Spanish, but were never adequately carried out. Remember that in 1749, the Spanish government passed a royal order designed to turn the mission properties over to the Indians and replace the missionaries with securlar parish clergy. Then, in 1813, the Spanish government ordered secularization of all missions that had been in existence for ten years. However, the Mexican Revolution prevented the enforcement of the order. As the timeline below indicates, it was not until the Mexicans came to power in California that secularization took place in ernest. 1824 - The National Colonization Law passed by the newly established Mexican government set rules that allowed Mexicans to acquire land grants on mission properties in Mexican territory. Foreigners could also purchase land grants, but no more than 71.5 square miles. 1825 - The first Mexican governor of California arrived with instructions to proceed cautiously and gradually to secularize the missions. 1826 - The governor's partial emancipation decree allowed a limited number of Indians to find work with Hispanic settlers, thereby breaking away from their lives on missions. 1828 - The Mexican Regulations sought to break the monopoly of the missions by making land grants available to Mexican settlers willing to migrate to California. 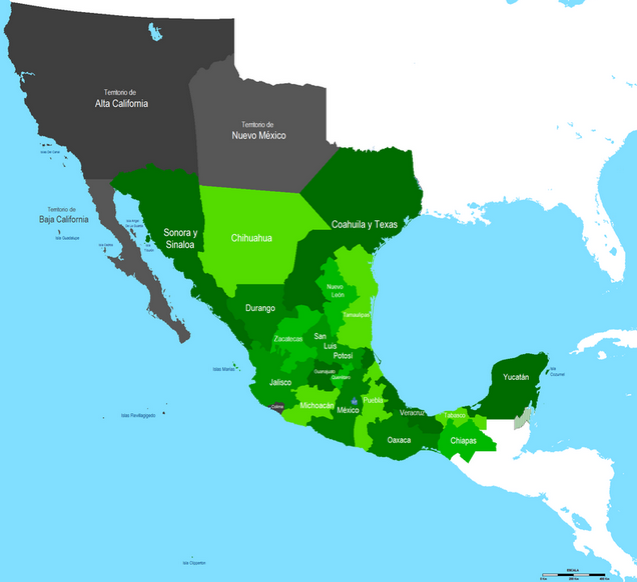 1833 - Under the Secularization Act, the Mexican government repossessed most of the lands that had been provided to the missions by the Spanish crown. Plans were made to convert 10 missions into towns in 1834, followed by six in 1835, and the remaining 5 in 1836.
if the provisional conditions were not met, the land grant could be "denounced" by another party who could then claim the land. Very few of these grants were carefully surveyed or mapped. Why? The grant applicant had to submit the petition to the governor, including a map of the desired land, then set about marking the boundaries of the grant. Very few of the Californios were literate and unable to carry out such provisions. So applicants casually mapped their lands and only vaguely described the area by citing key points - like a large rock, a creek bed, stunted tree, etc. Few property owners recorded their grants. So, most rancheros had no clear legal papers that could prove title to their holdings. So what did secularization under Mexican rule accomplish? The most fertile mission lands, as well as the mission cattle, horses, equipment, and cash, fell into the hands of the already wealthy local rancheros. The Indians received allotments of land and livestock that were too small to support themselves. Further, the rancheros forced many neophytes to sell their land while local officials did nothing to protect them. Thus, secularization resulted in shifting land ownership and control from the mission fathers to the already wealthy Spanish and Mexican ranchers. Creating a stable internal government in California. Throughout the Mexican era, Mexican leadership was extremely unstable; a series of governors came and went. Between 1833-1845 - the Mexican government had very little control over California. Instead, power fell to those willing to listen to the varying economic interests of the wealthy provincial ranchers. The era was characterized by failed attempts of the Mexican government to establish control over the local Californios. By 1845, California had suffered greatly from the neglect by Mexico, as well as from internal disputes between Mexican Californios who wanted the capital and power of the territory based in Southern California at the capital in Los Angeles and a growing group of foreigners involved in trading and based in Northern California who favored Monterey as the capital. Politically, then, California was both weak and divided. Economically, California was growing, but it was also divided between the ranching interest of Southern Californians and the trading interests of Northern Californians. The missions were secularized, but eventually, under American control, the Mexicans lost most of their lands. The Mexican population did not increase much, but there was a growing number of Americans and Europeans migrating to Alta California. A stable system of internal government did not arise, but there was some economic improvement for those who were cattle ranchers engaging in the hide and tallow trade. The demise of the missions dramatically altered California's economic development. While the missions had controlled the growing cattle industry, under Mexican rule, cattle-raising and the marketing of beef and hides fell to the rancheros and soon became the central factors of economic life. When the new Mexican government opened California to trade with foreigners by opening Monterey and San Diego to foreign ships, a new economy evolved around the hide and tallow trade. California ranchers became more and more dependent on the goods brought by the foreign merchants who came in search of cow hides and tallow. The ranchers traded their products for finished products that came largely from New England. Gradually, everything they used and much of which they consumed had to be imported. Because any type of manufacturing of hides and tallow had taken place in the missions, local attempts at manufacturing ended with secularization. So trade flourished while manufacturing diminished under Mexcican rule. Under both the Spanish and Mexican governments, not everyone benefitted from economic improvement. This leads us to our next discussion topic for today - the effects of Mexican rule on California Indians. In 1823 when the Mexican Republic flag replaced the Spanish flag in California, little immediate change in Indian policy occurred. This began to change, however, as a growing body of colonial leaders deeply resented the monopoly of Indian lands and the unpaid Indian labor enjoyed by the padres in the missions. The Mexican Republic's 1824 constitution declared Indians to be citizens with rights to both vote and hold public office. For some in the Mexican government, the idea was to finally break up the missions and provide the Indian converts with land on which they could sustain themselves. But in reality, the new government only gave 51 land grants to its colonial Indian citizens between 1824 and 1834. These lands had actually belonged to various tribes prior to the creation of the missions. As secularization became a reality, the mission Indians were gradually "freed". But the majority of surviving mission Indians were not native to the areas of coastal missions. As they returned to their tribal lands, they faced the difficult task of reconstructing their decimated communities in the wake of crippling population declines. Furthermore their tribal lands had been transformed by the introduction of vast herds of horses, cattle, sheep, goats and hogs that destroyed the native flora, the primary source of native diet. What developed from this new condition were guerrilla Indian bands made-up of former mission Indians and interior tribesmen from villages devastated by official and unofficial Mexican paramilitary attacks and slave hunting raids. Eventually a significant number of these interior groups joined together to form new conglomerate tribes - some of which began systematic efforts to re-assert their sovereignty by widespread and highly organized campaigns against Mexican ranchers and government authority in general. In short, Mexican rule, like that of the missions and pueblos during the Spanish era, contributed to the continuing destruction of California Indian society. Ironically, the increasingly aggressive Indian raids on the rancheros and other Mexican settlements, further contributed to California being the poorly managed and badly neglected stepchild of Mexico. Foreign businessmen. 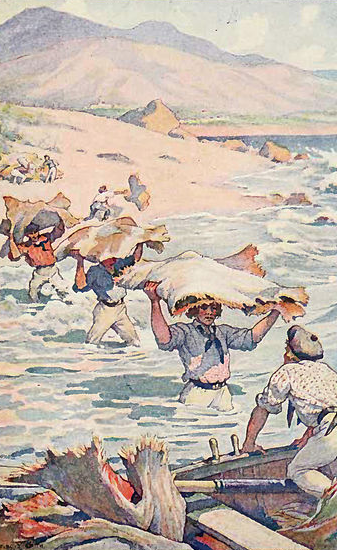 Arriving by sea, these businessmen were attached to the cowhide and tallow trades. Most arrived to negotiate a contract for a foreign firm. But some were encouraged to stay and become permanent residents who were then eligible for large land grants. Some of these men eventually married into Californio families and became rancheros themselves. These men generally were welcomed into the ranks of the Californios and usually obtained prestigious positions in society. In 1812, the first Russian settlement was established at Fort Ross in California as a station for the trade the Russians hoped to open with the Spanish Californians, as well as a source of food for the company's operation in Alaska. In 1814, John Gilroy, a Scottish sailor on an English ship, was left in Monterey because of illness. He was baptized and naturalized, then married a daughter of a well-known ranchero and became a ranchero himself. The present-day town of Gilroy bears his name. In 1822, William E.P. Hartnell who represented the British firm John Begg & Co. signed a three-year contract with the missions for their production of hides and tallow. As the first foreign businessman, Hartnell soon converted to Catholicism, married into a ranchero family, and acquired Rancho Patrocinio del Alisal. Mountain men. Arriving overland from the United States and its territories, the mountain men largely sought new sources for the fur trade. As such, they were the first foreigners to penetrate California's natural barriers - the deserts and the Sierra Nevada. 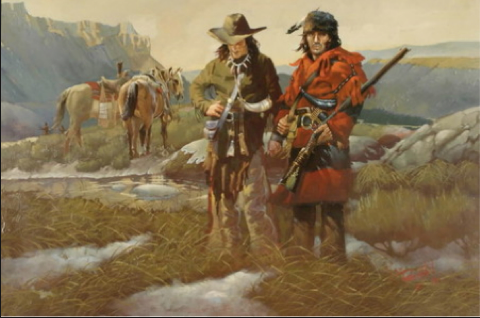 These foreigners - who were not as welcome as foreign businessmen - were greatly feared by the Mexicans because they came across the mountains and deserts that previously had acted as a natural barrier to American settlement. The mountain men blazed the trails that opened California to the east, they publicized the trails and wonders of California on the American frontier, and they led the first groups of Americans over the Sierra into California. And one of the first and most famous was Jedediah Smith who in 1826, led the first group of United States citizens - 17 fur trappers - over the Sierra Nevada and through the Mojave Desert to Mission San Gabriel. Smith then traveled to San Diego seeking permission to trade and hunt beaver. The governor detained him for six weeks, then released him with instructions to leave California the way he had entered. Instead, he moved into the San Joaquin Valley where he trapped until April 1827. He eventually made the first recorded journey by land up the coast of California and into Oregon. In 1833, Joseph Reddeford Walker led a group of fur trappers who were the first United States citizens to open a central route over the Sierras. He crossed the Great Basin to the Humboldt River, proceeded across the dessert, and came to the lake and river east of the Sierra that is now known as Walker Lake. His group then made the first east-to-west crossing of the Sierra and may have been the first whites to see Yosemite Valley and the region's giant Sequoias. Frontier settlers. Arriving overland from the U.S. and its territories, the frontier settlers were determined to settle in California. Leading the way in 1836 was John Marsch who came to California to practice Medicine. He purchased a large rancho across the bay from San Francisco wherehethen wrote dozens of letter to family and friends in the east in which he extolled encouraged further American immigration. In 1839, John Sutter, a Swiss immigrant who came to America to seek his fortune, came to California where he acquired a huge land grant in the Sacramento Valley. By 1941 he had developed a 44,000 acre settlement, Little Helvetia, that lay at the terminus of the main westward trails (and is today's Sutter's Fort). Sutter encouraged American migration along these trails, sent supplies east to immigrant parties in trouble, and received new immigrants with hospitality and chances to work, sold them land, and leased them Indian laborers. In 1841, John Bidwell and John Bartleson led the first organized group of United States citizens across the Great Plains to settle in California. Beginning at Sapling Grove on the Missouri River, 32 Americans - including Nancy Kelsey and her infant daughter who were the first white women to travel west to California by wagon - arrived in California. Later in the year, another small group of 25 Americans entered under the leadershp of William Workman and John Rowland. 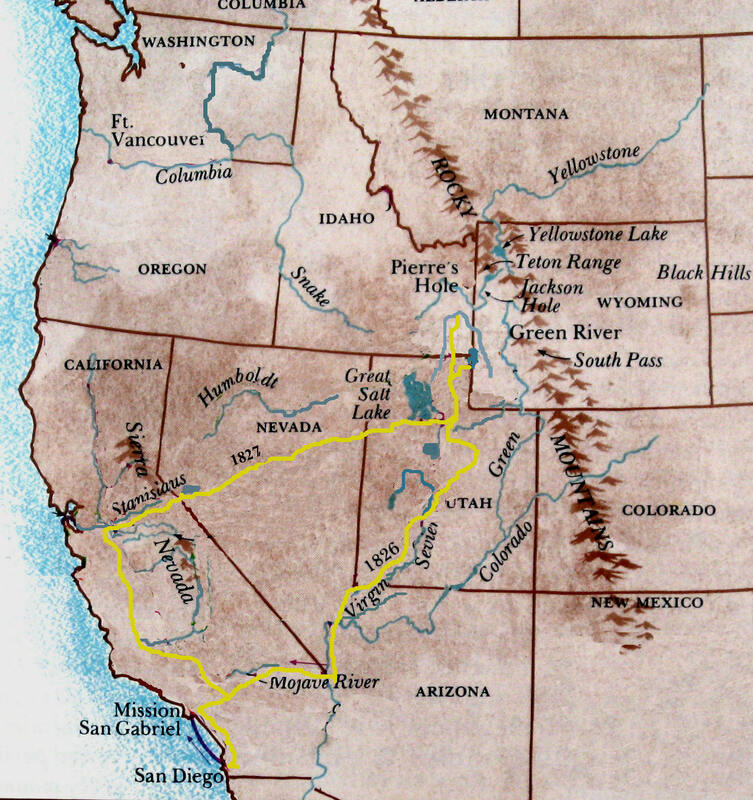 In 1843, John C. Fremont began the first of two three expeditions to California, traveling west to the Columbia River, turning south, and crossing the Sierra Nevada by way of Carson Pass in the middle of winter. He then traveled the length of the San Joaquin Valley, crossed Tehachpi Pass to the Mojave and followed the Old Spanish Trail east. His report of the journey as well as maps about the routes were published upon his return. Most famous of all his maps was that created under Fremont's guidance by Charles Pruess and published in Baltimore in 1848. In 1844, the first wagons came across the Sierra Nevada in the Stevens-Murphy party of 52 people. By 1845, the migrations, while unwelcome, had remained small. This all changed in 1845 with 250 Americans came over the Sierra Nevada. Moreover, they brought reports that as many as 2,000 more planned to follow within a year. In 1846, 1,500 American arrived and settled in California. In all, about 2,000 Americans lived in California and they had effectively begun to colonize the land either by buying, renting, or squatting on it, or by receiving land grants of questionable legality. In summary, these foreign movements into California were but one more example of how the Mexican government was losing control over its province. It had passed a series of laws limiting immigration and requiring all those who did immigrate to become citizens and convert to Catholicism. These laws were not reinforced and even worse, some Americans were able to get substantial land grants without following any of the legal guidelines. Thus, foreign immigration would be one of the final ingredients contributing to the breakdown of the Mexican government and the beginning of a rebellion known as the Bear Flag Revolt. Goal #5: To learn about the origins of the Bear Flag Republic. At the same time that individual Americans began migrating to California, the U.S. government demonstrated interest in the Mexican territory. Thus began the first of several efforts to incorporate California into the increasingly expanding boundaries of the U.S.
1835 - President Andrew Jackson offered Mexico half a million dollars for San Francisco Bay and the territory north of it. 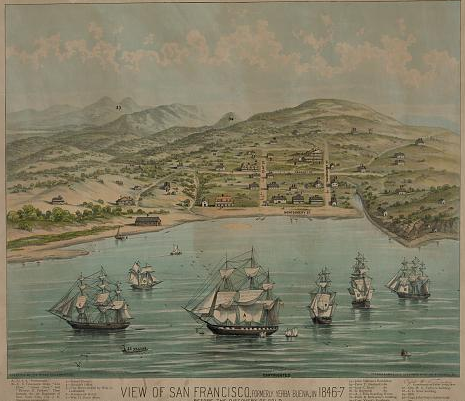 The President wanted the Bay as a port for American trade and whaling in the Pacific. 1838-1842 - Lieutenant Charles Wilkes led a U.S. sponsored naval expedition to California to chart the waters and observe conditions. The expedition included a large party that went overland from Oregon to San Francisco through the Sacramento Valley. 1842 - Daniel Webster proposed a deal in which the U.S. would pay debts the Mexican government owed to the British in return for Texas and part of California and Oregon as far north to the Columbia River. In September, the commander of the American Pacific Squadron received a false report that the U.S. was at war with Mexico and that Mexico intended to cede California to Great Britain rather than have it fall into American hands. He promptly sailed to California because one year earlier, he had been instructed to do so in case of war with Mexico. He landed at Monterey on October 18 and the next day, demanded a peaceful surrender. On October 20, the surrender was concluded, the American flag was raised, and the American sailors marched ashore to the tunes of "Yankee Doodle Dandy" and "The Star Spangled Banner." His proclamation that California was now occupied by the Americans lasted one day when he realized he had been misinformed. 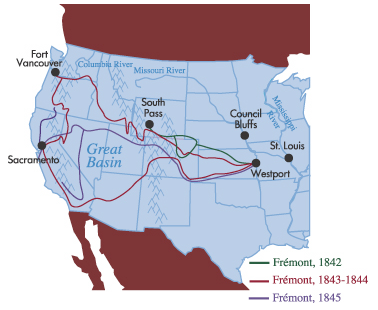 1843-44 - Congress published John C. Fremont's "Report and Map" which guided thousands of overland immigrants to Oregon and California from 1845 to 1849. 1845 - After coming into office, President Polk confided to his Secretary of the Navy that aquiring California was one of his most cherished goals. Thus, the U.S. offered Mexico $40 million for Upper California and New Mexico. Polk sent an agent to California to try to persuade them to declare their independence from Mexico and seek the protection of the U.S.
1846 - In April, Mexican Governor Jose Castro proclaimed that the purchase or acquisition of land by foreigners who had not been naturalized as Mexicans "will be null and void, and they will be subject (if they do not retire involuntary from the country) to be expelled whenever the country might find it convenient." Rumors began to spread that Castro's edict would soon be enforced, and that the California Indians had been encouraged to burn the crops of foreigners. On June 14th, a band of armed Americans rode into Sonoma, raised a homemade flag with a bear and star - the "Bear Flag," and proclaimed the creation of the Bear Flag Republic under American control. 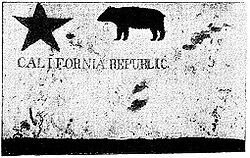 The words "California Republic" appeared on the flag and their actions were later called the "Bear Flag Revolt." The Americans then woke up General Mariano Vallejo who commanded the northern garrison for Mexico, and demanded that he surrender. After some muddled negotiations, Vallejo agreed and was promptly arrested and hauled off to Sutter's fort to be imprisoned. On June 23, John C. Fremont - who had returned to California earlier in the year - arrived with sixty soldiers and took command in the name of the U.S. Fremont, however, was acting without orders. On July 2, when part of the Pacific naval squadron entered and captured Monterey Bay, Californians learned that the U.S. had formally entered into war with Mexico on May 13th. Commodore John Sloat raised the American flag on July 7, and on July 9, the U.S. flag was raised at Sonoma and Yerba Buena and at Sutter's Fort on July 11. The Bear Flag Republic ceased to exist after 26 days and the U.S. Army took control of California. Little is actually known about the Bear Flag Revolt. The following, however, seems to be the agreed upon origins:. Only about 90 Americans were in the initial band of rebels. Most of them had migrated together in the party of immigrants under William Ide who stepped forward as the leader of the disorganized movement. They were motivated by fears and rumors that the Mexican government was planning to deport all American settlers - most of them were illegal immigrants. This, of course, had been fueled by the April proclamation by Governor Castro - a proclamation that everyone knew could not be enforced. Remember, Mexican California never had enough military power to enforce anything! Ide and his followers claimed that they feared "extermination" by the Mexicans. Ultimately, the revolt was the natural consequence of a large, rowdy population living within a poorly administrated and enfeebled province that treated them as an unwanted minority. So, by July, California was under control of the U.S. However, because we were at war with Mexico, nothing was certain. For almost 200 years, immigration has been a problem between Mexico and the United States. Our story begins in 1821 when two important events occurred: Mexico finally won its independence from Spain and almost at the exact same time, a small group of Americans become interested in immigrating to the Mexican state of Texas. For the next 25 years, Americans were involved in a struggle over Texas - a struggle that was eventually won by the North Americans and brought California into the United States. 1821 Moses Austin - an American - received a grant from the new Mexican government to establish a colony of 300 American families in Texas. Each family could purchase up to 170 acres for agriculture and another 128 acres for stock raising - a total of 298 acres. The government asked 12-1/2 cents per acre, tax free. The grant stipulated that all settlers must be Catholics or willing to convert to Catholicism; that all public transactions must take place in Spanish; and that all immigrants had to relinquish their US citizenship and take an oath of loyalty to Mexico. When the Americans began arriving, they were the minority among 3,000 Mexican ranchers who lived in Texas - one of the least populated areas of Mexico. Other Americans felt that if Austin could get such a generous grant, they could too. The United States was still struggling with the aftermath of the Panic of 1819 and soaring land prices within the United States made the Mexican land policy seem very generous. Thus, a substantial migration to Mexico began. 1823 The Mexican government passed a law prohibiting the sale or purchase of slaves, requiring that the children of slaves be freed when they reached fourteen, and mandating that any slave introduced into Mexico by purchase or trade would also be freed. 1824 The American population in Texas exceeded 2,000 plus an additional 450 slaves. They lived in isolation, largely excluding themselves from the 3,000 Mexicans. 1825 The Mexican government began worrying about the increasing number of American immigrants and asked for an investigation of how colonization was proceeding in Texas. 1829 The investigation found that most Anglo Americans had refused to become Mexican citizens, had largely isolated themselves from Mexicans, and perhaps most troubling - the immigrants had ignored the slave reforms passed by the state. In response, the Mexican government officially outlawed all slavery in Mexico. To circumvent the law, many Anglo colonists converted their slaves into indentured servants for life. Others simply called their slaves indentured servants without legally changing their status. Slaveholders wishing to enter Mexico forced their slaves to sign contracts claiming that the slaves owed money and would work to pay the debt. The low wages the slaves received made repayment impossible, and the debt would be inherited. 1830 Mexico passed a law prohibiting further American immigration into Mexican territory. Americans, however, ignored the immigration law and continued to cross the border. 1832 Texas prohibited worker contracts from lasting more than ten years. 1834 On June 12, Santa Anna, the new Mexican President, dissolved Congress and immediately formed a new centralized government - a dictatorship backed by the military. Several states openly rebelled against the changes - including Texas. 1835 Santa Anna revoked the Constitution and began centralizing and consolidating his power. As protests spread across Texas, Mexican officials blamed the Anglo settlers for the discord, noting that they continued to live in isolation from Mexicans and had not become citizens. 1836 Americans had become the dominant population in Texas; there were 38,000 American settlers and about 5,000 slaves, versus 7,000 Mexicans living in Texas. 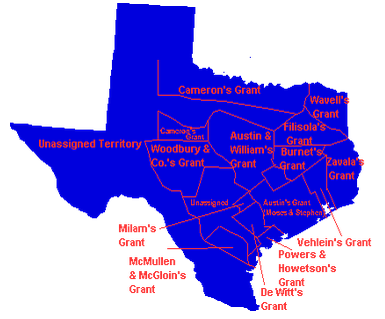 Additionally, the settlers held title to several huge land grants - grants that encompassed over half of the entire state of Texas. On March 2, the American colonists in Texas proclaimed a provisional government - the Republic of Texas and declared independence from Mexico. The American colonists maintained that Mexico had invited them to move to the country and they were determined to enjoy the republican institutions to which they were accustomed in their native land, the United States of America. A battled ensued - the battle of the Alamo - and ended with the Battle of San Jacinto on April 21, 1836. At San Jacinto, Sam Houston had organized a counterattack and surprised Santa Anna’s forces at San Jacinto. A systematic slaughter ensued. After the battle, 2 Americans and 630 Mexicans were dead. Santa Anna was captured and promised to convince the Mexican government to recognize the Republic of Texas. Santa Anna did not keep his promise and the Mexican Congress refused to accept Texas's independence. In October 1836, Sam Houston became president of the new Republic of Texas with a western boundary at the Nueces River. 1838 Sam Houston invited the U.S. to annex Texas, but Congress declined. Why? Mexico refused to recognize Texas independence and the Whigs (advocates of federalism) felt annexation would bring war with Mexico. 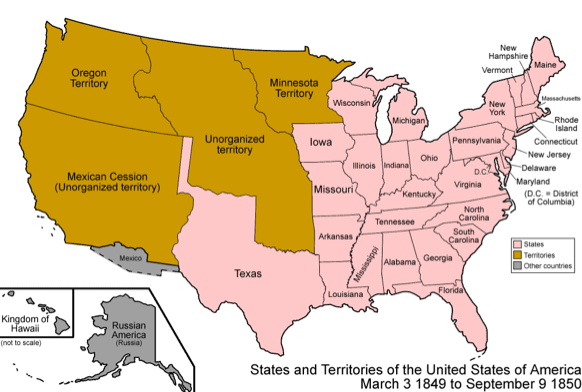 Further, the northern Whigs did not want another slave state entering the Union. 1845 Shortly after James Polk assumed office as the President of the United States, he convinced Congress to annex Texas with the southern border set along the Rio Grande. Texas was admitted to the union as a slave state. But admission had not been easy. The United States Congress passed - after much debate and only a simple majority - a Joint Resolution for Annexing Texas to the United States. 1846 On February 19, Texas was admitted to the United States as a slave state. Mexico immediately cut off relations with U.S. and insisted that Texas’s southern boundary was the Nueces River, not the Rio Grande which was 130 miles to the south. 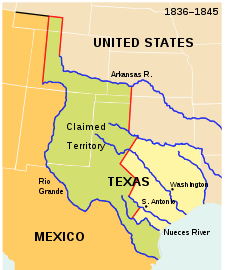 President Polk responded by ordering American troops under General Zachary Taylor to the disputed territory - the border area between the Nueces and the Rio Grande Rivers. The U.S. government declared it had no choice but to go to war with Mexico. Mexican forces crossed the Rio Grande to attack the U.S. army and on May 11, 1846, the U.S. was at war with Mexico. Cold Call: Fourth cold call on required viewing -Watch the movie The Mexican-American War at http://www.youtube.com/watch?v=vKNZfBOVgJA (1 hr. and 28 minutes). Shortly thereafter, many Mexican officials left for Mexico, Los Angeles was occupied without resistance, and Stockton announced in August that California "was entirely free from Mexican dominion." Stockton then ordered martial law in Los Angeles - an area of California where strict maintenance of order was not well known. When some Los Angelenos responded by not obeying orders, they were arrested and treated as rebels. On October 8, the Americans met a rebel force of Californios who defeated them and took control of LA for three months. Rebel victories were short lived - they knew they could not hold out until Mexico won the war with the U.S. They did not have enough troops and ammunition .So, on January 13,1947, rebel forces surrendered at the Capitulation of Cahuenga - thus ending organized resistance to the American occupation. 1948 - War with Mexico ended on February 2 with the signing of the Treaty of Guadalupe Hidalgo in which Mexico ceded California and other territories to the U.S. - half of its total land. The U.S. acquired a colony that was 1 million acres (almost 50% of all Mexican territory) and contained rich farmlands and natural resources such as gold, silver, zinc, copper, oil, and uranium. With the acquisition of the Northern Territories of Mexico, the U.S. became a hemispheric power - largely because of the new ports in California that would facilitate economic expansion across the Pacific. Almost 30% of all American troops who fought in the war died. More than 16,000 lives were lost. More than 5,800 Americans were killed or wounded in battle, 11,000 soldiers died from diseases, and others eventually died from their war injuries. U.S. spent between $75 and $100 million dollars. Many 21st century historians argue that the Mexican American War was the first American War of conquest - or as some have even stated, a war in which the U.S. "bullied" a weaker power to gain new territory by conquest.
" ... the Mexican American War ... does not fit well with our idea of what American history is all about. We like to structure our history around important wars ... and we remember these wars as conflicts where we were attacked by an aggressor. And this aggressor had particular designs on things central to who we are - our liberties, our fundamental freedoms - but through enormous sacrifices, we overcame the odds and drove back this threat. And the Mexican War does not fit this pattern." For Mexico, the war was a series of tragedies - largely because the war was fought almost entirely on Mexican soil. 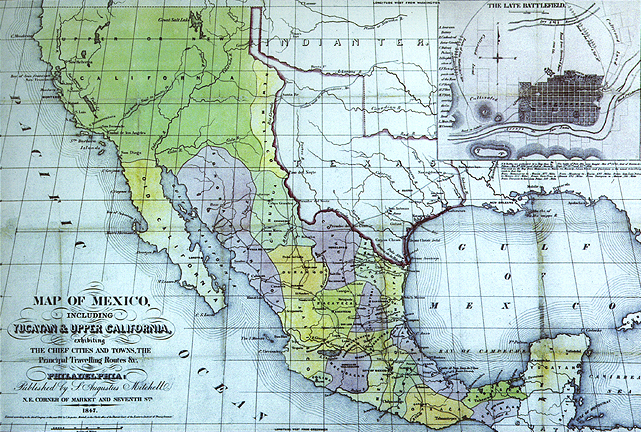 Mexico lost half of its nation - and all of Alta California.. Besides the thousands of military and civilian deaths during battles, the war left tens of thousands of orphans, widows and disabled. Some cities suffered great losses and destruction due to artillery shelling and small-arms gunfire. The nation's economy was severely disrupted by the naval blockade and movement of thousands of troops across the land, as well as the steep decline in agricultural and mineral production caused by the massive conscription of peasants. The political instability during and immediately after the war led to a new despotic regime and eventually to another civil war. The Mexican population suffered severe psychological damage and their national dignity and honor were shattered largely due to the humiliation of having their capital and much of the country occupied by enemy troops and the horror of a peace treaty that cost Mexico half of its national territory. Consequently, a deep and long-lasting feeling of resentment toward Americans arose within much of Mexico. 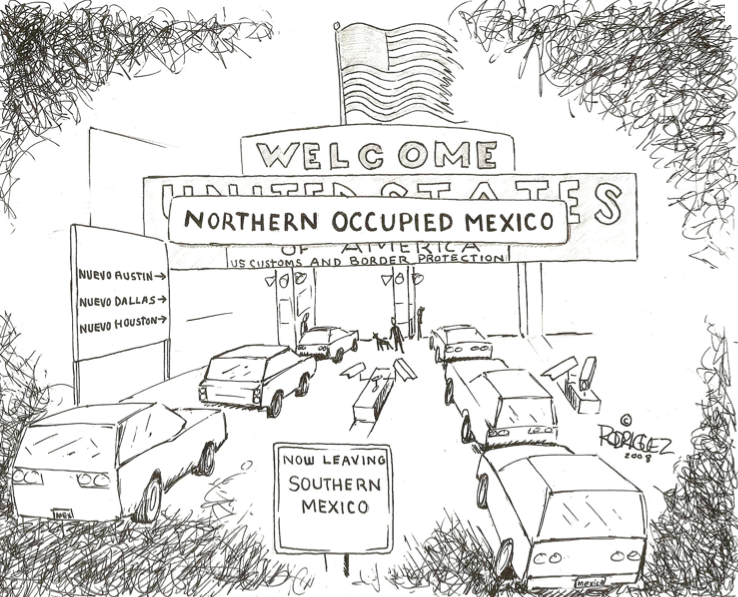 The Mexicans who now lived in the United States - what many began to call "Occupied America" - did not fare well. They became alienated from the dominant, Anglo European society. They became the target of racist violence because whites believed Mexicans posed a threat to the economy of the southwest. They were dispossessed of their land and subsequently went from being landowners to laborers. California offers a tragic illustration of the Mexican dispossession of land. It all began in the early 1820s when the new Mexican government came to power. Over 800 large tracts of California land had been granted to Hispanic and some Anglo-American settlers. Most grants were not accurately surveyed and mapped, which made the claims difficult to prove when California passed into American hands in 1848. Trouble began with Article X - a part of the original Treaty of Guadalupe Hidalgo - which provided that all Mexican land grants would be honored in California. However, the United States Senate removed that protection when ratifying the Treaty. In order to investigate and confirm titles in California, American officials then acquired the provincial records of the Spanish and Mexican governments. In 1851, the California Legislature passed an "Act to Ascertain and Settle Private Land Claims in the State of California" which required all holders of Spanish and Mexican land grants to have their land titles confirmed by the newly-created Board of California Land Commissioners. This Act placed the burden of proof of title on Spanish and Mexican landholders - and this was a difficult burden because in most cases, the land grants were made without closely defining the exact boundaries and even when boundaries were more specific, many markers had been destroyed before accurate surveys were made. Although 604 of the 813 claims brought before the Land Commission were confirmed, most decisions were appealed to US District Court and some even went to the Supreme Court. The confirmation process required lawyers, translators, and surveyors, and took an average of 17 years to resolve - making it very expensive to defend land titles. In many cases, land had to be sold to pay for defense fees or given to attorneys in lieu of payment. And what were the consequences on the Mexican land owners in California? Before 1850, Mexican Californios owned all the land valued at over $10,000. By the 1870s they owned only one-fourth of this land; most Mexican ranchers had been reduced to farming rented property. Upon losing their land, most Mexicans became laborers - on ranches, large farms, in the mines, and in railroad construction. All of the work was difficult, low paid, and often migratory. Work for Mexicans gradually became more exclusively labor involved. In 1850, 34% of the rural Mexican population in Texas were ranch or farm owners, 29% were skilled laborers, and 34% were manual laborers. By 1900, only 16% were ranch or farm owners, 12% were skilled laborers, and 67% were manual laborers. By 1900, the former Mexican landowners in California were almost all landless. Select someone from each group to write down the questions and another person to present them to the class as a whole. Make sure all of your names are on the list of questions, which will be submitted at the end of class today. Groups 1-4 will take 15 minutes to develop two possible essay questions. These must be thoughtful questions - ones that ARE NOT DESIGNED FOR YOU TO REGURGITATE WHAT WE HAVE LEARNED, BUT RATHER TO HAVE YOU REALLY THINK ABOUT AND ANALYZE THE CLASS DISCUSSIONS AND REQUIRED READINGS. Furthermore, at least one of them must be tied to one of more of the course themes which are posted on the screen. The first question should be one that your group thinks would adequately assess how well you have understood the materials presented about the geological and geographical foundations of California. The second questions should be one that your group thinks would adequately assess how well you understood the era of Spanish control over California. The third question should be one that your group thinks would adequately assess how well you understood the era of Mexican control over California. Groups 5-8 will take 15 minutes to develop two possible essay questions. These must be thoughtful questions - ones that ARE NOT DESIGNED FOR YOU TO REGURGITATE WHAT WE HAVE LEARNED, BUT RATHER TO HAVE YOU REALLY THINK ABOUT AND ANALYZE THE CLASS DISCUSSIONS AND REQUIRED READINGS. Furthermore, at least one of them must be tied to one of more of the course themes which are posted on the screen. The first question should be one that your group thinks would adequately assess how well you have understood era of Mexican control over California. The second question should be one that your group thinks would adequately assess how well you have understood the entrance of Anglo-Americans into California and the Mexican loss of their one-half of their nation to the United States. home to a relatively small population of Spanish, Mexican, and people of mixed descent, a larger but dwindling population of Indians, and a small but powerful population of American immigrants. Secularization of the missions destroyed the power of the mission padres and the facilitated the transfer of most of the missions' productive lands to a small but powerful group of rancheros. The growing cowhide and tallow trade introduced California to commercial interests in other parts of the world, especially in the U.S. and Britain. The penetration of the Sierra Nevada and California's deserts by American mountain men and their reports upon returning to the east coast led to the immigration of a small but significant number of American frontier settlers who, despite the law of Mexico, never became naturalized citizens or converted to Catholicism. While the ethnic makeup of California continued to be extremely diverse, social and economic stratification intensified with most economic, social, and political power residing in the very small class of rancheros. The non-Indian population of California grew: the Mexican population more than doubled and made up 60-80 percent of the non-Indian population and the American population grew from a few dozen in the 1820s to almost 2000 at the end of the era. The rancho economy, like those of the missions and pueblos during the Spanish era, contributed to the continuing destruction of California Indian society. 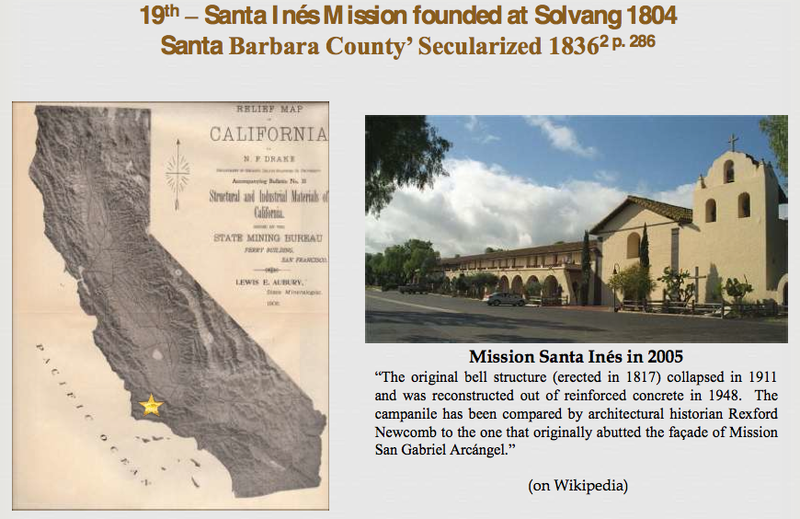 Despite the fact that missions were originally designed to be secularized and the lands distributed to converted mission Indians, Indians did not benefit from secularization. Indeed, only a small percentage of mission Indians received mission lands, and such lands were usually not enough to support the families. Other mission Indians became servants on the rancheros where their treatment was largely one of beneficent paternalism. The majority of surviving mission Indians relocated to interior tribes which were undergoing great hardships and transformations due to non-native immigration to California. What emerged from this situation were many guerrila Indian bands who organized campaigns against Mexican rancheros and government authority. By the time of the Bear Flag Revolt, the Mexican government had lost control over its territory. Thus, American immigration was the final contributor to the breakdown of the Mexican government. The revolt was the natural consequence of a large, rowdy, American population living within a poorly administered and enfeebled territory. By the end of the Mexican-American War when California was officially ceded to the United States, California was a deeply divided society - politically, socially, and economically. When gold was found seven days before the Treaty of Guadalupe Hidalgo was signed, California's new-found wealth would contribute to these divisions. During the Early California period characterized by European exploration and white contact with California, a pattern arose. Imperialistic policies first by the Spanish, then by the Russians and Mexicans, and finally by the Americans ensured that California would become the battleground for a colonial empire. California Indians were subjugated through genocidal policies designed to destroy their religious, cultural, political, and economic traditions. California's geography, climate, social diversity, and economic opportunities made it an ideal destination for immigrants from around the world. This pattern will continue to evolve during our next unit of study - "Building and Modernizing American California."